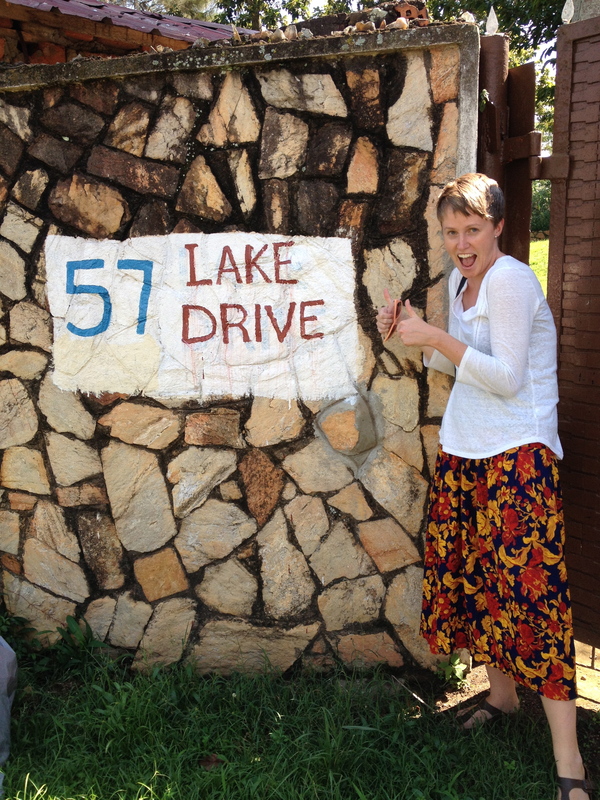 I have now been in Uganda for five weeks. The team of international staff came here for what we thought would only be a short time, but our stay was extended as insecurity in Beni region persisted with additional attacks against vulnerable civilians and increased tension in the population. What we thought was a single cluster of events has turned out to have a much deeper political underpinning. The reason for the attacks and who exactly is behind them are still very much a mystery. The attacks have mostly been attributed to the ADF NALU rebel group, but a string of other theories proliferate. There are rumours of political parties financing unrest to suit their purposes, since there has been alleged involvement of army personnel in the attacks and a string of arrests of prominent business leaders in Beni. My stay here sort of feels like a strange dream. It has been a challenge to continue with my work, but I am trying as best I can to keep moving along with the research. Last weekend I made the very difficult decision that the rest of my time would be better spent in Uganda rather than trying to go back to Beni. I realized that even if I did go back, the city would be in no state to support the research, and also that it would be more productive for a few researchers to come to me for training in Kampala where there is a certainty of electricity and internet. The decision was a hard one and I am sad that my time was cut short. A few days later the leadership of Congo Initiative and UCBC both in Beni and the US advised that the international staff not consider returning until the new year, when hopefully the situation will become more clear. I’m frustrated that my three months was cut to one month, but I can’t even imagine how hard this must be for the full-time staff who call Beni home and have left a close-knit community behind. Even though it has been a period of discouragement, I couldn’t have spent my time as a nomad with a better group of people. 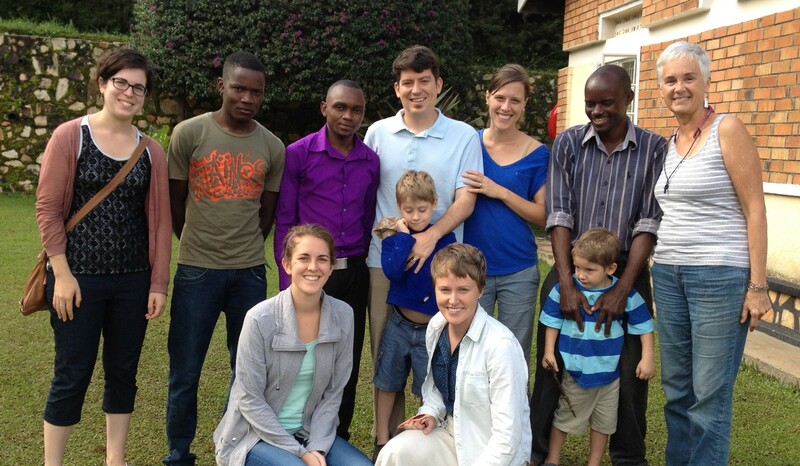 The rest of this post is devoted to remembering some of the moments spent here in Uganda this past month. To summarize our time in Uganda, the team arrived on October 22nd and spent two and a half weeks in Fort Portal in Western Uganda. For a week of that time we stayed at a guest house called Rwenzori View and then for the rest of the time moved into a more affordable guesthouse called Golf Course View. We went to a hotel called Mountains of the Moon to have our own little sunday worship time. We ordered tea and orange juice only to discover afterwards that the juice costed 15000 shillings per glass which is often the price of a whole meal. From that point on all things expensive were compared to “the glass of juice”. Fun fact: “Mountains of the Moon” is actually the meaning of “Rwenzori”. 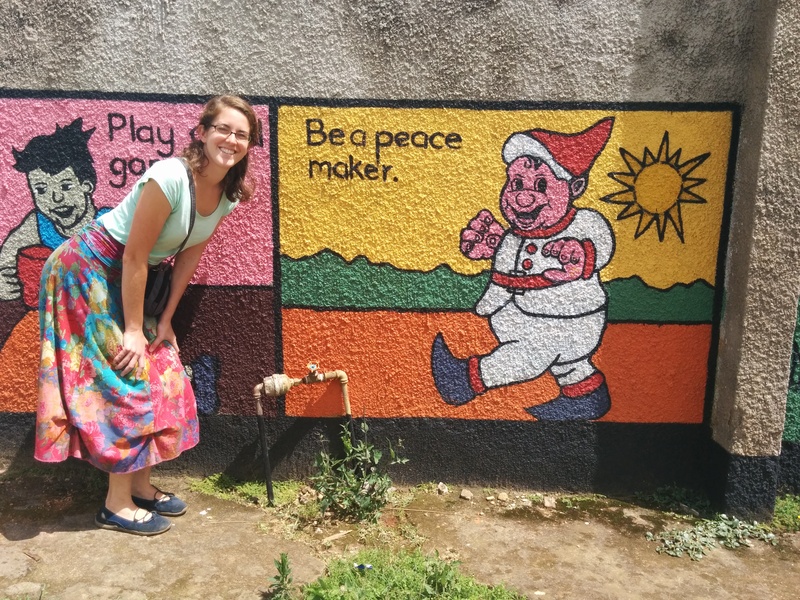 Lauren and Jessica and I went exploring in Fort Portal one day and happened across an adorable little bakery called Sweet Aromas. We were surprised to see a “mzungu” american come from behind the curtain. She started the business as a bakery at ugandan prices and plans to pass it on once it is established. The baked goods were delicious! On halloween we bought a bunch of candy, made our own costumes and decorations, and had the boys go door to door in the guesthouse to go trick-or-treating. To add more doors to trick-or-treat from, I occupied the washroom. I have good memories eating at a restaurant called Dutchess. The price was right and the food was delicious. Their pizza was particularly good and they had a few dutch delicacies, my favourite being bitterballen! I also tried a croc burger there! We have enjoyed many fantastic game nights including Bang, Speed Scrabble, and Dutch Blitz! I got the ladies into watching Broadchurch. At dinner time we made the habit of speaking french just for practice. The meals at Golf Course View were delicious. Breakfast always included a spread of fruit, toast, pancakes, and omelettes. This felt strange after my tea with bread and butter in DRC! When we learned that we would be staying in Uganda longer, we decided to move to Kampala where we found a more affordable housing rental option on AirB&B that had a kitchen so that we could cook for ourselves. What has been a blessing about being in Kampala is that I have been able to visit eMi on occasion and even use their office as a place to work a couple days in the week. 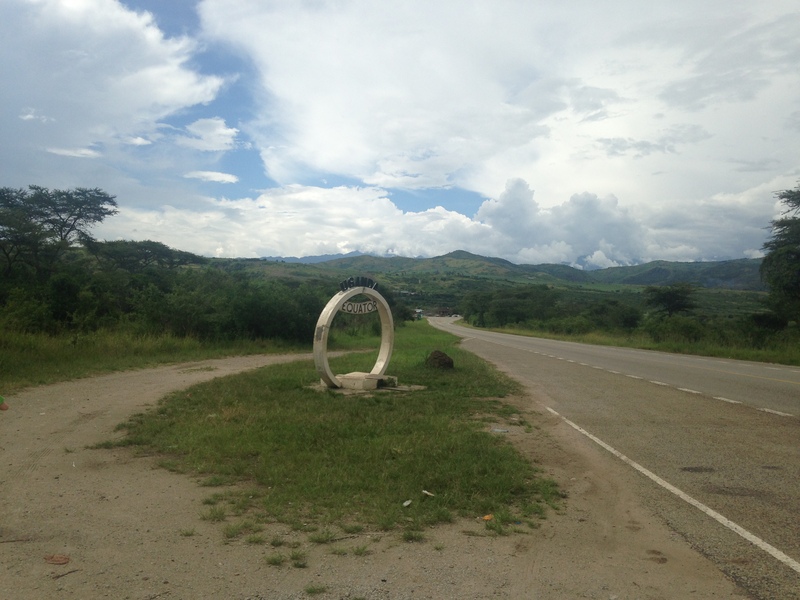 Although it’s a much crazier place than Fort Portal, there are many people and places to see. On different afternoons we have brought our work with us to different cafes in the city. Almost all of us have friends and contacts in Kampala who we have been able to reconnect with. 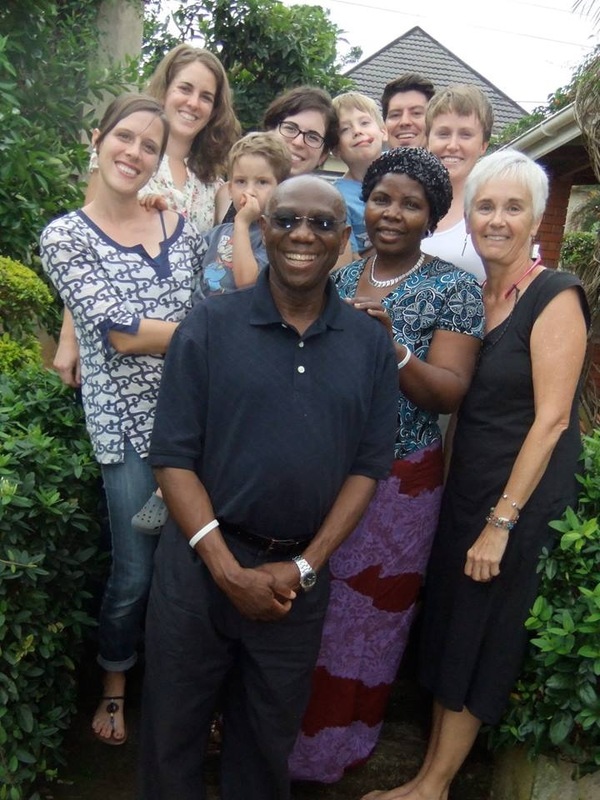 One Sunday we went out for breakfast with the Greenes and then went to Entebbe to visit some friends of the Shaws who they know from Congo. They treated us to a lovely lunch and then took us to the Entebbe Wildlife Park. We went to Entebbe again a few days later, this time to visit David and Kaswera who are leaders of Congo Initiative and UCBC and are just returning home to Congo after their year long sabbatical. It was wonderful to share a meal and receive encouragement and wisdom from them. 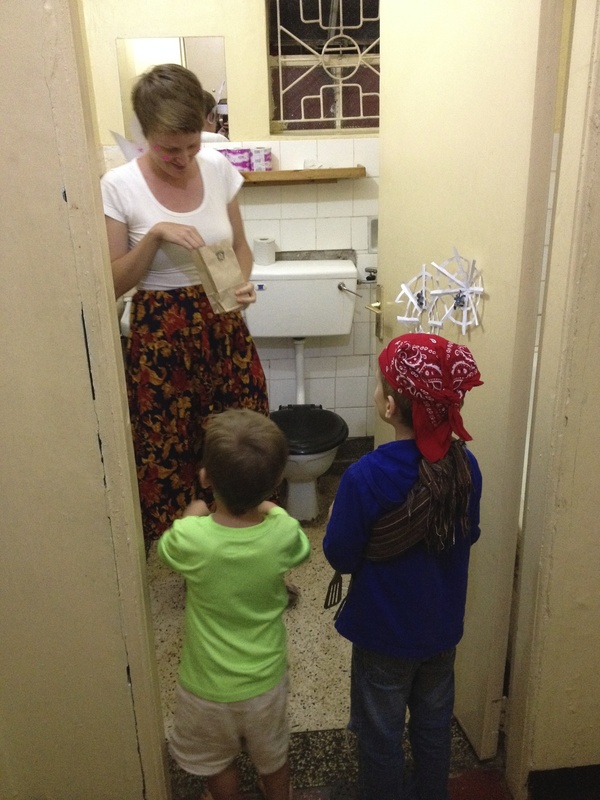 We were all stuck in rush hour traffic on the way back from Entebbe on the day that Jon and Kate had planned a dinner out and we had offered to babysit the boys. 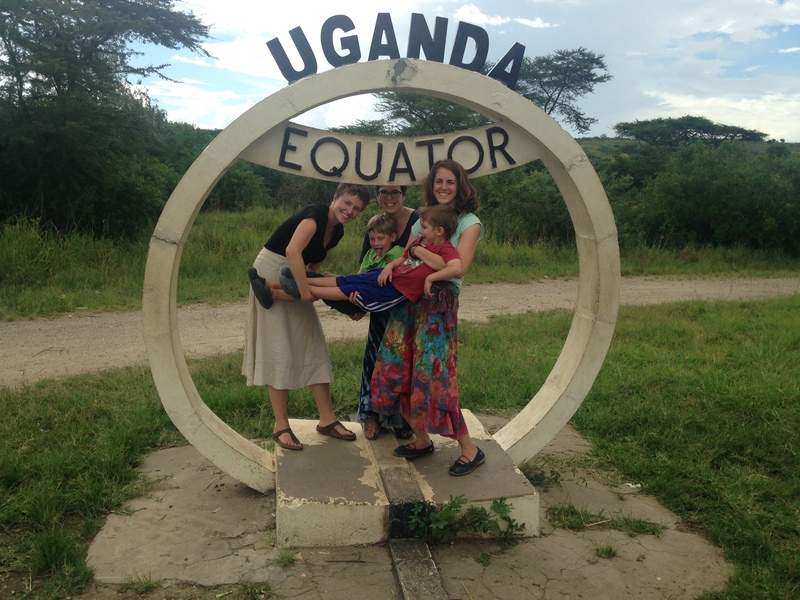 Solution: Lauren and I each took a kid home on a boda, Jon and Kate left for dinner on bodas, and poor (but amazing) Mary drove the two hours it took get home (normally a fifteen minute journey). Just this evening I shared american thanksgiving with the team. We cooked up a delicious array of food! I feel so blessed to have had the support and fellowship of such a great group, even only knowing them a short time. One thing that has been frustrating about recent events in Beni region is how poorly they are reported on by the media and therefore how distorted the situation must look to westerners. There was one particularly bad article that came out on Reuters and Yahoo a few weeks back that claimed an act of cannibalism without having any witnesses to the event. I was happy to find an article a few days later that countered the article and condemned the practice of using clickbait and stereotypes to gain readership. This is a similar lesson for news coverage of other conflicts around the world. During the recent insecurity in Beni, I have begun following more news of the Congo and reading more materials in an attempt to try to understand some of the complexity of Congolese politics. Here is a blog I found by Jason Stearns called Congo Siasa. He is the author of the book Dancing in the Glory of Monsters that I read a while back. He wrote one post in particular that discusses the recent insecurity. It’s a few weeks old but I want to share it because it does a much better job describing the situation than the news. Last weekend I had an opportunity to go white water rafting on the Nile. I joined seven of the eMi interns early on Saturday morning on the Adrift bus to Jinja. At the launch point we were provided a light breakfast and introduced to our Kiwi raft guide Dan. He had a hilarious sense of humour however crude at times, but he had us all relaxed and excited. He quickly convinced us that we would enjoy flipping the boat a few times. The Nile is apparently one of the few rapids in the world where it is safe to flip the boat and where they intentionally try to flip. There is so much water in the Nile and the rocks are so deep that if you fall out you just get sucked under for a few seconds and then pop up downstream. It was such a strange feeling to feel the water tug you in different directions. I had a bizarre calm when I was under the water. It’s like this bizarre trust exercize that physics will do its thing. There were several large breaks between rapids where we would paddle, share stories, and sometimes jump out for a swim. The most amusing moment was watching the guys try to do back flips off the raft! Half way through the day we enjoyed lunch on an island, and after the last rapid we had a small barbecue and got to see a slideshow of the pictures from the day. I also got to enjoy a beer that is named after the final rapid we went on called the Nile Special. The folks at Adrift got some pretty epic shots of us. My favourite ones are the three below that show a before, during, and after of one of our epic flips. It’s kind of cool to see frozen images of something that happened in mere seconds! That’s me hanging off the boat in the second shot! I thought I would share some of the experiences I’ve had here so far that make this time in Congo (and now Uganda) quite a memorable experience! You might have to check back on this post to see if it grows over time. I burned myself on the tail pipe of a moto while dismounting. I’ll be more careful from now on to mount and dismount from the left side! It healed up well though. I ate a raw termite that Jon and the boys captured from the termite mound in their backyard. It seems as though I can never turn down trying a new food or else I can’t say that I tried it! Slimy yet satisfying? I cut my own hair for the first time. I had no choice but to try since it can look bad pretty fast if I let it go for too long. I actually proved quite adept at it even though I only had a 4 by 3 inch mirror. I had a run-in with bedbugs at the guesthouse where I was staying. As a result I had to change rooms and go through four days borrowing Jessica’s clothes while mine sat in black plastic bags in the sun to make sure we killed all of the bugs. The good news is that the eradication was successful. I rode side-saddle on the back of a moto. The first time was with a friend but I quickly got used to riding that way on my own. I found out that it is actually easier and more comfortable than straddling, especially when wearing a skirt which is most of the time. I ate my first guava ripe off the tree that is in the yard. Yum yum! 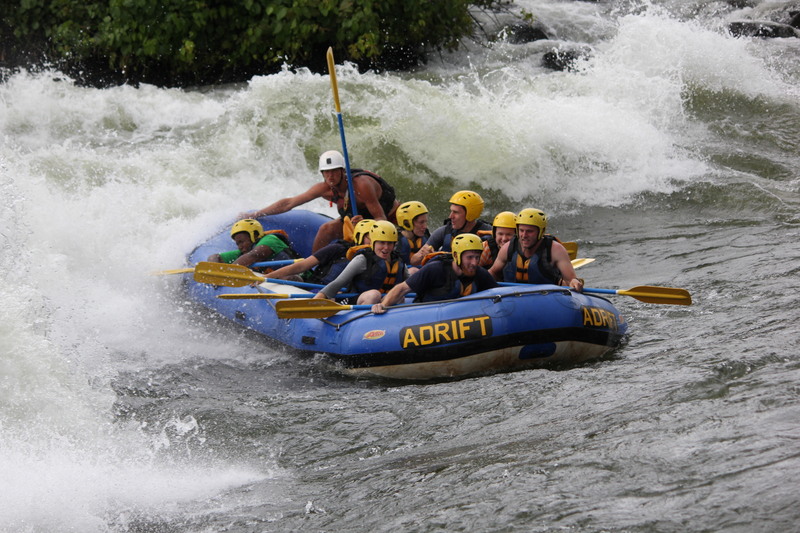 On Saturday I went white water rafting for the first time on the Victoria Nile! I had the opportunity to go when I worked with eMi two years ago (I organized the trip), but a few days before the trip I injured my knee and couldn’t go. I was visiting the eMi office this week and learned that the current interns were planning to go and that they actually had an extra space reserved. Coincidence? I think not! 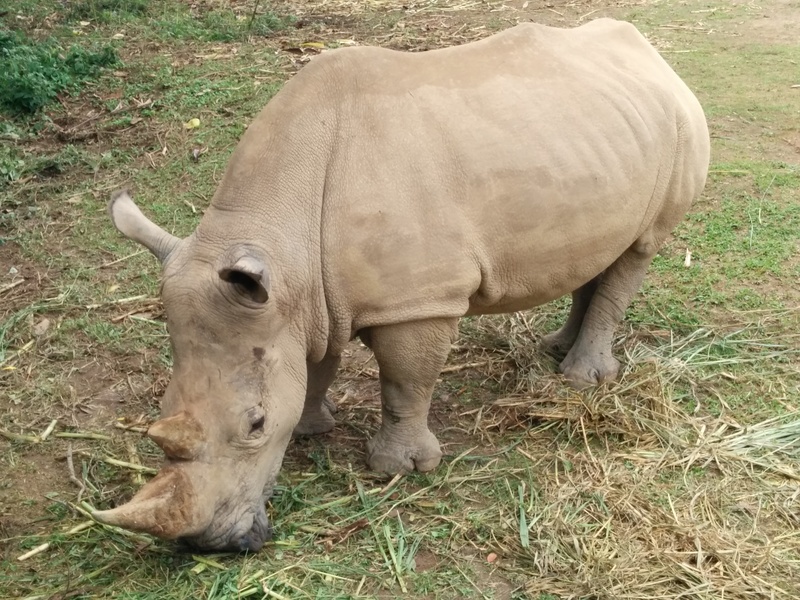 I touched a white rhinoceros at the Entebbe Wildlife Park. They are gigantic and their skin is super tough! They are such amazing creatures and it is so sad that there are none left in the wild in Uganda. Fort Portal is located in Western Uganda and is where the international team has been staying during the period of insecurity in Beni territory. 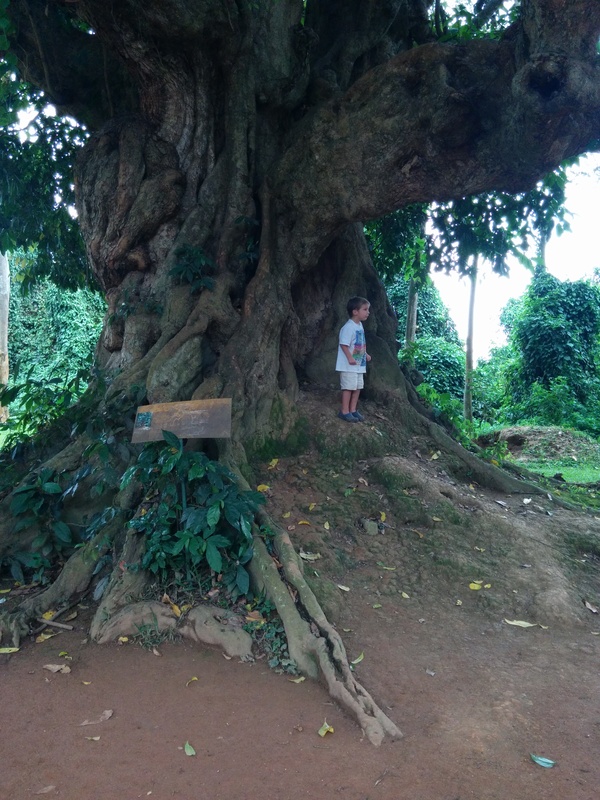 It is very much a tourist destination because it is near two national parks, has a view of the Rwenzori mountains, and has a collection of crater lakes. In the first few days of our stay we took time to enjoy some of the surrounding nature. On one day the group of us returned to Kyaninga Lodge to see it during daylight. I was so glad we went back because the view was spectacular. We hiked down to the crater lake that offered a completely different perspective of the landscape. Another day Jessica and I went to visit an old friend of hers from her university and he took us to the Holy Cross Novitiate outside of town that was also on a crater lake. I never get tired of looking at the African sky! The night before we left for Uganda Jessica shared that it was her one year anniversary of being in Beni. To celebrate she pulled out some yummy chocolates. The wrappers had messages and mine said, “An exhale moment deserves delicious chocolate.” We agreed that the upcoming journey to Uganda was going to be a much-needed “exhale moment”. That evening there was a city wide protest against the insecurity. We heard gunshots fired as police disbursed the crowd, but at the time we didn’t know what was going on. We huddled in a corner praying and singing. The tension of that evening confirmed that we had made the right decision to leave, however difficult it would be to part from our community of friends and colleagues. Early the next morning we headed off. 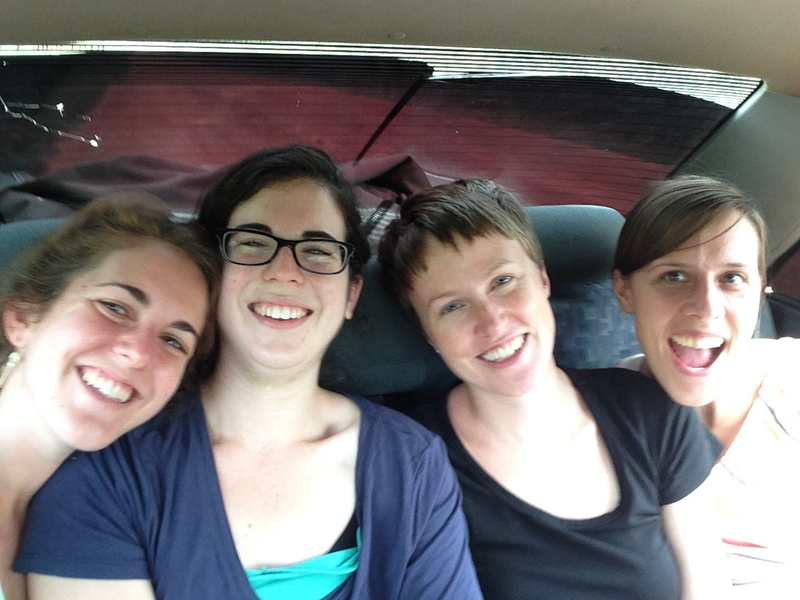 We fit all seven of us in one taxi because it didn’t make sense to pay for two cars when we could squeeze into one. The four ladies sat in the back and the boys sat on Jon’s lap in the front. When we were about half way on the Kasindi road, I had a strange moment when I began loosing feeling and then movement in my hands. We had to pull over two different times so that I could shake it out. I think my body was finally responding to the fatigue and stress of the last few days. Finally I laid down and closed my eyes which seemed to help for the rest of the way to the border. 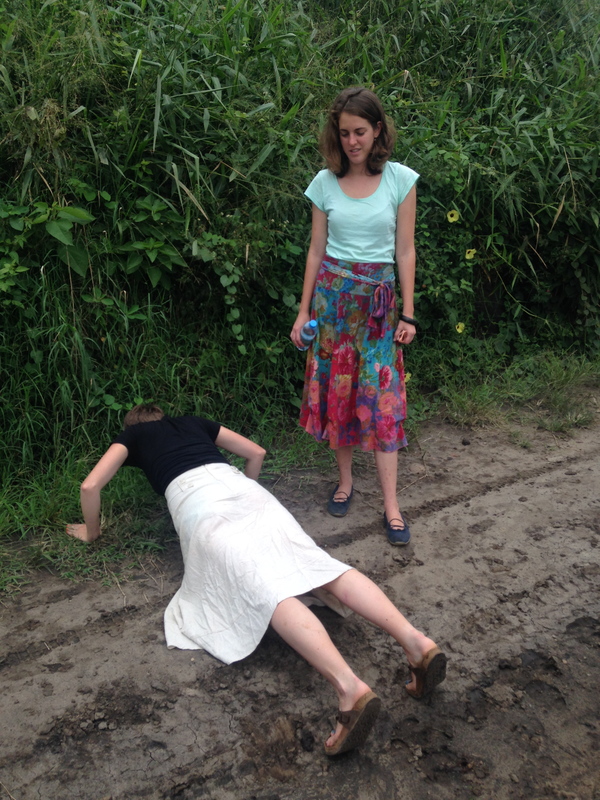 We had no problem crossing the border into Uganda and the rest of the journey was smooth. We even took a small detour south to play tourist and straddle the equator. Alexander Mdogo (the Little) beside the chocolate wrapper. I really need to take him out more. Push-ups on the side of the road to get feeling back into my hands. The boys can say that they have been held across the equator.